On Wednesday, April 10, Grand Valley State University held their 23rd annual Student Scholars Day. Student Scholars Day is an important day for student researchers to display and discuss their research from this year. The GVSU men’s and women’s track and field teams were all over the Midwest this weekend, competing in the Gorilla Classic, Bison Outdoor Classic, and the Ball State Invite on Saturday, April 13. Cannabis is now legal recreationally in Michigan for residents over the age of 21. As citizens and state lawmakers continue to navigate this change in law, the subject of intoxicated driving proves to be one of the biggest discussion points surrounding cannabis legalization. The Truman Scholar Award is a nationally distinguished award for members of the undergraduate community who portray exemplary dedication, leadership and involvement in areas of public service. Cameron Jones, a third-year student double majoring in political science and international relations, was announced as one of 199 finalists for this award in late February of this year. The recipients of this scholarship will be announced April 17. After President Donald Trump’s recent executive order for universities to uphold all forms of free speech on campus or risk losing federal funding, a group of anti-abortion activists from Grand Rapid’s Inner City Church Planting Mission showed up on Grand Valley State University’s campus April 8 to see how officials would respond. The group was directed by David Schutte who had previously demonstrated on the university’s campus. Schutte and his fellow demonstrators initially set up near the Cook Carillon Tower (a designated free speech zone of GVSU), then later left the zone to see if campus police would respond. Police did not interfere. First-year student Kylie Thornberg said she witnessed part of the demonstration as she walked around campus. “There were about four or five people handing out pamphlets and approaching students,” Thornberg said. “They also had a banner hung up on the clock tower showing disturbing images of abortion, which I think was simply used for shock value.” Thornberg was directly approached by the group and asked if she wanted a pamphlet. She declined the pamphlet and walked away. She said that she does not believe demonstrators on campus should be allowed to go right up to students. “They had the big banner displayed,” Thornberg said. “It was obvious they were demonstrators. If someone was interested in their message, they were easily identifiable for students to approach them.” GVSU’s Pro-Life organization also had a display up near the Carillon Tower from April 8-11. Their display included “The Cemetery of Innocents,” which was marked by rows upon rows of pink flags, with each flag representing 927 aborted babies. GVSU’s Pro-Life Organization was unaware that the group from Inner City Church Planting Mission would be demonstrating and is unaffiliated with them. Member Sarah Remillard said she believed the Inner City Church Planting Mission’s activists confused students who saw both displays, especially given the fact that members of the Inner City Church Planting Mission were shouting at people passing by. “We share the same opinion, but we go about in a very different way,” Remillard said. “We are on this campus to talk to people, not yell at them.” Her group opted to take their display of The Cemetery of Innocents down early on April 8 to save confusion and avoid being associated with the other demonstrators. Their display was put back up the following morning. According to Remillard, she witnessed at least five people attempting to take down or damage the sign near The Cemetery of Innocents. One student ran off with it, but was apprehended by campus police. The sign was later returned with a personal apology. Both Thornberg and Remillard said they believed Trump’s executive order could change the atmosphere of college campuses. While Thornberg thinks free speech on campus is “extremely important,” she said she is worried Trump’s executive order could increase the activity of hate groups. “Every group will be allowed to protest, leaving the campus vulnerable to hate speech," Thornberg said. "I doubt Trump is trying to protect free speech. I think he wants to allow white supremacy and hate speech on college campuses, and this executive order does just that." Remillard also believed the executive order would increase discussion on campuses, but remains hopeful that this won’t cause major disagreements and polarization between opposing sides. “If everyone is able to talk, no one is being oppressed and silenced from their point of view," Remillard said. "Trump’s order will increase discussion, but I think polarization will just depend on how willing people are to keep an open mind." Last year, Swedish teenager Greta Thunberg began capturing the attention of the world when she elected to skip school every Friday in order to sit outside the Swedish Parliament building until her nation’s government did more to acknowledge climate change and become in accordance with the Paris Agreement. Vice President for Enrollment Development Lynn “Chick” Blue received praise for working 50 years at Grand Valley State University during her building naming ceremony on April 9. 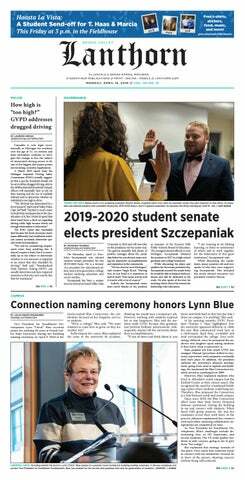 Held at the newly-named Blue Connection, the celebration focused on her longtime service to students. ‘Elite’ is a word that has been devalued in the sports world with it being around seemingly to everyone and everything who accomplish anything, but those are who are truly the most dominant in their sport are often overlooked.